Do you need a crate for puppy training? Or perhaps you want a heavy duty one that your dog can’t destroy? There are many different dog crate designs on the market, so you’re bound to find one that suits your needs. I’ll tell all the factors you need to consider when you’re choosing a crate, how to measure your pooch, plus we’ll look at the main styles of crate available and the pros and cons for each. How To Choose The Right Dog Crate? 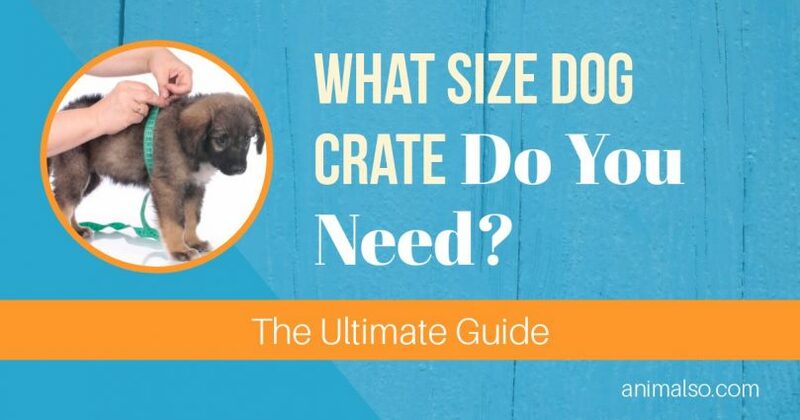 What Size Crate Should You Get For A Puppy? If your head is spinning after reading all that, don’t worry! Later on, we will give you a breakdown of all the different types of crates along with which dogs (and people!) it suits best. It is important to get the size of your dog’s crate right. It shouldn’t be too cramped, but it shouldn’t offer too much space, either. Your dog should be able to turn around easily and sit up without hitting her head on the top. She should also be able to stretch out her legs when lying on her side. Dogs need leg room, too! Dog owners often buy crates that are too large to give their dog lots of extra space, but this actually detracts from the crate’s usefulness as a training tool. For example, crates can be used for house training, but if your dog has too much room in her crate, she could end up using one corner as a bathroom. What’s more, crates can give your pooch a feeling of security, which your dog won’t be feeling if she has lots of empty space around her. 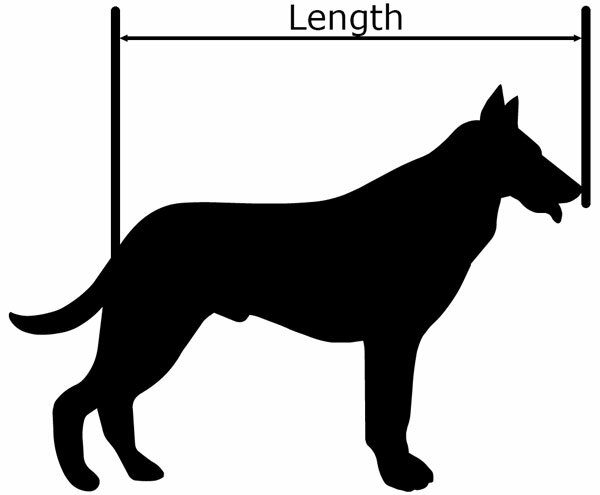 So, let’s talk about measurements for a fully-grown dog. If she is an adult, you will need to measure her length and height. (I suggest having some treats to hand!) Measuring the width of your dog is not necessary, as once you have the right height and length, the width will be proportional. To accurately measure the length of your dog, get her standing on all four paws and measure from the tip of her nose to the base of her tail. 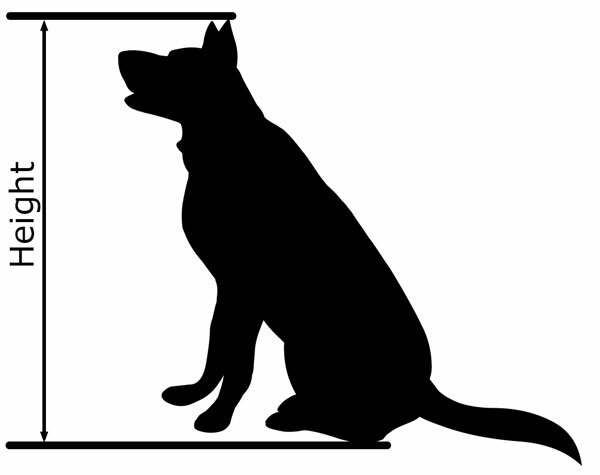 You do not need to include the entire length of your dog’s tail, or the crate will be too big. For very thick, hard tails, you can measure a little of her tail if you wish - this is because when she wags, it will hit against the crate. Again, add 2 - 4 inches, and you’ve got the minimum height* for your crate. *These measurements will give you the minimum crate size. If you get a crate that is a few inches bigger, it shouldn’t matter. More than that, however, could result in a crate that is too large for your dog, and, as mentioned above, will not make a good crate training environment. If your budget allows it and you’d prefer to buy different-sized crates for your dog throughout their growing period, you can use the same method as above. But let’s face it; pups grow fast so that money won’t last! So, if you choose to do this, I would advise you not to spend too much money on your first purchases. Once she reaches adult size, you can opt for more expensive, stylish crates that she can enjoy for longer. Below is another handy money-saving tip I’d like to suggest. It’s highly likely that your dog’s size as a puppy will be very different to her full-grown adult size, meaning she will need a far smaller crate during puppyhood. And what about all the stages in between? A divider is a removable wire or wooden panel you insert into the crate to adjust the available size. So, as your little one grows, you can keep altering the position of the divider to give her the space she needs. That way, your dog will get all the benefits of a well-fitted crate from puppyhood to adulthood. I have provided a weight and height bracket for each section, so you have a rough idea of which category your dog is likely to fall under. Your dog’s gender - as well as the possibility of mixed ancestry - affects her size. So, bear in mind that he or she may need a bigger or smaller crate than what is listed here. >>For our review of the top 15 best crates for extra small dogs and puppies, please click here. 24” (61cm) dog crates are the best size for the following small breeds weighing between 11-25 lbs and ranging from around 13”-17” in height. >>For our review of the top 15 best crates for small dogs and puppies, please click here. 30” (76cm) dog crates are the best size for the following medium-sized breeds weighing between 26-40 lbs and measuring about 18”-19” in height. >>For our review of the top 30 best crates for Large dogs, please click here. >>For our review of the top 30 best crates for Large & Extra Large dogs, please click here. Dog crates come in many different packages, and each has its own set of advantages and disadvantages. Some crates are more portable than others because they are collapsible, while others can be used for airplane travel. The right one for you depends on the way you want to use it, if you want a certain style to match your home, and how destructive your dog is. These are probably the most widely-used type of dog crate. Usually, they come with a single door on the front, but some models also have doors on the side and the roof for greater access. This type of crate is good for dogs who like to see what’s going on around them. If your dog gets anxious on seeing their surroundings while in their crate, using a crate cover can remedy this. They’re also a great choice if you live in a hot climate, as they have good ventilation. For dogs living in colder climates, you may want a more sheltered model. Wire crates are the most popular choice for those who want collapsible dog crates for portability. They can be a bit heavy, especially the larger-sized ones. So, if you go on lots of trips with your dog, you could consider getting a second lighter-weight crate just for travel. They are also the best option if you want to purchase just one adult-sized crate when she’s a puppy, as you can easily adjust the space by using a divider. This makes them suitable for people on a budget who would prefer to buy just one crate that lasts from puppyhood into adulthood. If a dog has an accident in a wire crate, or if they’re muddy, and then they shake, that’s not good news for the surrounding room. >>For our review of the best Wire Dog Crates, please click here. When you think of portable dog crates, plastic crates are probably what comes to mind. These crates are very light and easily transportable, so they are a good option if you go traveling a lot with your pet. Usually, the two halves can be stacked inside one another for easy storage, but they do take up more room than wire crates, as they do not collapse. The majority of plastic crates come airline approved, so they are your best bet for air travel. If you need one for this reason, you should double check the documentation before buying. Despite the fact that many models of plastic crates are marketed specifically as “transport” crates or “pet carriers,” but they can be used for permanent use at home, too. They have less visibility compared to wire crates, so they are good for dogs who are easily distracted or anxious on seeing their surroundings and prefer a den-like atmosphere. They are also more sheltered, so they are a good option if you live in a cold climate. Moreover, while they’re not indestructible, they are more difficult than wire crates to escape from. Some dog owners also prefer plastic crates as they can be easily cleaned. Some customers prefer plastic crates for easy cleaning - they can be hosed or sprayed down easily in case of accidents or just for general cleaning. Also, unlike with wire crates, if your dog is messy and she shakes, it’s not going to reach far outside the crate. Does not fold flat - requires more storage space than wire crates. It is worth noting if your dog is snub-nosed (e.g. like a pug), this can affect the size of the crate for airline trave﻿l. Due to their breathing difficulties, some airlines do not allow them to fly at all. >>For our review of the best airline approved pet carriers, please click here. These look less cage-like than wire or plastic crates, so they can be a good choice for those who think the other types are unsightly. As well as for use in the home, they are a very practical, portable option for those who love to travel with their pooches. Whether at a picnic, in the garden, or on a trip to the beach, they can provide a very nice shelter for her. Super lightweight, they can be easily carried, and, when not being used, you simply fold them flat. While these models are available for large dogs, due to the heavier weight, they are harder to carry with your dog still inside. They are usually machine-washable, so you can simply throw it in the wash without getting your hands dirty! The soft material means that this isn’t the most durable of crates, so it’s better used for occasional trips rather than a permanent home. Oh, and it certainly isn’t a good choice for destructive dogs or for those who can easily work their way out! Extremely light and portable - perfect for camping trips, picnics, going to the park, etc. More intelligent dogs can learn how to unzip their way out. >>For our review of the best Soft Dog Crates, please click here. Heavy duty dog crates can be expensive, and they aren’t the most beautiful, but they are certainly worth it if your dog has these naughty habits. By buying one that can’t be destroyed, you’ll be saving yourself a lot of money and stress! Some of these models are also approved for airline travel, so you don’t have to worry about your dog getting up to no good while you’re in the air. Plus, if she already uses this crate at home, she will be accustomed to it and more relaxed while traveling. Not the most attractive - but your dog will sure look tough in front of her friends! >>For our pick of the best heavy-duty dog crates, please click here. There are some very stylish crates on the market made from finished wood or rattan, so if you don’t like the idea of wire or plastic crates in your home, you don’t have to compromise. Your dog’s crate - quite literally - doesn’t have to cramp your style. These wooden crates can actually be used as furniture! You can replace a side table, or perhaps get one you wanted anyway, and - woah! - you’ve got a place to put your mug of coffee as well as a little den for your number one companion! They are available in a wide range of styles, so you can choose the one to suit your taste and the decor of your home. These types of crates are not a good option for destructive hounds, as their teeth and claws will damage the wood. Some models do come with a removable plastic tray for easy cleaning, but I still wouldn’t recommend them for house training, as any accidents will leave stains on the wood and odors may be hard to eliminate. It’s best to buy this type of crate once your dog is fully grown, as they are expensive. So, if you’ve got a well-behaved, house-trained pooch that’s all grown up and you’re willing to spend a bit more on a stylish dog crate, this could be the one for you! Some come with removable plastic trays for easy cleaning. >>For our review of the best Stylish Dog Crates, please click here. No crate is “best,” exactly, as it totally depends on what you need it for. I will say that wire crates give you the best value for money and they’re the most practical. This is because they can be collapsed for easy storage, they’re transportable, and you can just buy one and use dividers. For travel - particularly on airplanes - plastic crates are the best choice, and these can also be used at home. If you want the best of both worlds, you can always purchase a wire crate for home use and keep a plastic crate handy for your travels together. It is available in either single or double door design with slide-bolt latches to lock the door/s in place. It also includes a free divider panel, a strong carrying handle, a removable plastic pan, and rubber feet to protect your floors. This is a collapsible dog crate that packs down to portable size, making it ideal for storage or travel. If you’re looking for a plastic crate for travel, the Petmate Sky Kennel is a great option that comes in sizes to suit all dogs. For a plastic crate, this is a heavy duty model, made with high-strength plastic, extra strong steel wire, and a secure wing-nut and bolt design. It has two doors for easy access - one at the front and one on the roof. As well as these two doors, there are also openings on the sides and back of the crate, which gives it four-way ventilation, keeping your dog cool and stopping her from feeling too “boxed in” as other solid plastic crates might. This model is airline approved and comes with "Live Animal" labels, identification stickers, an absorbent pad and food and water cups. She’ll be ready to jet set with you straight away! To get the right size dog crate, be sure to carefully measure your dog’s length and height as we explained. As for the style of crate, that is entirely up to you. Wire crates are the most practical, as they can be easily assembled and collapsed, and they’re the best choice for people on a budget. Plastic crates, on the other hand, are great for the travelers among you, and many come airline approved. Soft-sided crates are also good for traveling with your dog. However, as they aren’t as durable and they’re not airline approved, they are better suited for short trips. I’d recommend a more durable crate for permanent use at home. Lastly, stylish wooden crates are the least practical but the best-looking. They’re great for grownup hounds that wouldn’t dream of chewing their crate or doing their business where they sleep. Finding a good dog crate can be really difficult when you are also looking to add to your home’s decor rather than take away from it. When I read through the article, you mentioned stylish dog crates and their duality as furniture. This is such a great alternative for owners who don’t want to lose style. I have a Bernese Mountain Dog and I would like to bring her during my travel to Brazil. Her weight is 36 kilos and the maximum allowed to transport (dropped but not cargo transportation) is 45 kilos. Do you know if exist a Kannel 700 with only 9 kilos? If yes, could you please recommend it? Consider hiring a pet sitter while you’re away.